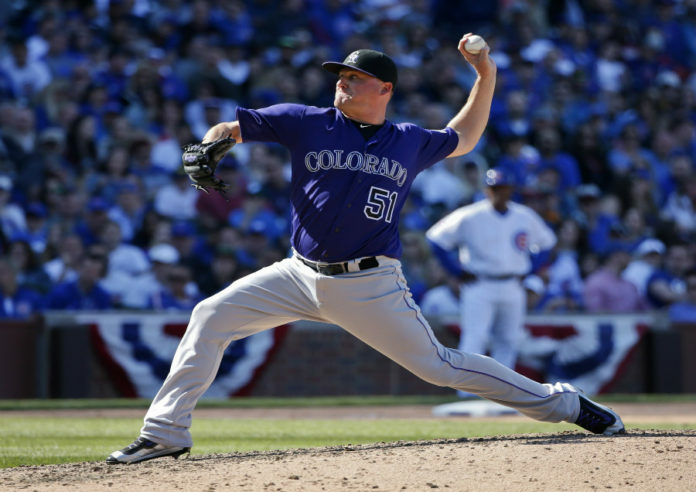 Jake McGee landed on the DL with left knee inflammation, and will be out indefinitely. Carlos Estevez will step in and be the acting closer for the meantime. He has a solid 26% strikeout rate, but does have an 11.1% walk rate. Unfortunately he pitches in Coors, but he has shut the door in the last three outings, and has yet to allow a baserunner. Estevez is a solid pickup for the meantime. The Nationals placed Jonathan Papelbon on the DL, with a right intercoastal strain. This is something that can linger, so we could deal with a Nationals backup situation for a little bit. Shawn Kelley will serve as the acting closer in the meantime, and is a guy to immidietely go out and grab. He has a 36.5% strikeout rate on the season, and just a 6.3% walk rate. Kelley also boasts a 2.45 ERA backed by a very solid 2.12 FIP. Dusty Baker actually did us a favor -- which he doesn't do often -- and named a closer here. If he is available go out and snag him. Glenn Perkins is finally done for the year, and Brandon Kintzler is now up, with Kevin Jepsen out of the picture. Kintzler doesn't have electric stuff, and a 4.66 FIP isn't suggesting success is coming. The only positive for him is that he avoids walks. For me this is still a situation to avoid. Will Harris hasn't been the issue in the Astros bullpen, but he has taken over a sloppy situation. He has a 1.68 FIP and a 26.7% strikeout rate. He has also notched five saves in the month of June with no issue. Ken Giles and Luke Gregerson have not been efficient in the backend role. At the moment, Harris is the guy to own. Cincinnati is still dreadful, but Tony Cingrani has been better in June. He has allowed a .249 wOBA to hitters this month, compared to a .372 in May. The 13.9% walk rate is still going to be an issue, but at the moment, Cingrani is still the guy. Mainly because there are no other options. Cincinnati has been a team to only approach in the bullpen if you are desperate. Ryan Madson has had a couple of rocky outings at Houston, and against Los Angeles. The Oakland backend is still a situation where both Madson and Sean Doolittle are being used for saves. Between the two of them their fantasy worth isn't a ton, but if you are deeper leagues both are worth a look.